Amos R. Hinchaw, age 24, born in Ohio; farmer; $1800 real estate. Sarah J. Hinchaw, age 21, born in Virginia; cannot read or write. Elizabeth J. Hinchaw, age 6, born in Indiana. Jesse McCan, age 23, born in North Carolina; farmer. Amos R Hinshaw, age 35, born in Ohio; farmer; $1800 real estate; $200 personal property. Elisabeth Hinshaw, age 29, born in Indiana. Elisabeth J Hinshaw, age 10, born in Indiana; attended school. Frances A Hinshaw, age 9, born in Indiana; attended school. Americus A Hinshaw [sic], female [sic], age 5, born in Indiana; attended school. Sulestine E Hinshaw, age 4, born in Indiana. Sarah J Hinshaw, age 2, born in Indiana. Senormah Hinshaw, age 1, born in Indiana. James Stickley, age 23, born in Ohio; day laborer. Hinshaw Amos R, age 37, born in Ohio; farmer. Hinshaw, Amos, age 45, born in Ohio; farmer; $1600 real estate; $800 personal property. Hinshaw, Elizabeth, age 39, born in Indiana; keeps house. Hinshaw, Alonzo, age 17, born in Indiana; attended school. Hinshaw, Americus, age 16, born in Indiana; attended school. Hinshaw, Celestina, age 14, born in Indiana; attended school. Hinshaw, Sarah J, age 13, born in Indiana; attended school. Hinshaw, Theron Nanco, age 11, born in Indiana; attended school. Hinshaw, John, age 3, born in Missouri. Hinshaw, Millie, age 1, born in Missouri. Hinshaw, Amos, age 55, born in Ohio; father born in Ohio; mother born in North Carolina; farmer. Hinshaw, Elizabeth, wife, age 49, born in Indiana; parents born in North Carolina; keeping house. Hinshaw, Sarah J, daughter, age 22, born in Indiana; father born in Ohio; mother born in Indiana. Hinshaw, Theron, son, age 19, born in Indiana; father born in Ohio; mother born in Indiana; farm hand. Hinshaw, Jno D.T., son, age 13, born in Missouri; father born in Ohio; mother born in Indiana; farm hand. Hinshaw, Mattie, daughter, age 10, born in Missouri; father born in Ohio; mother born in Indiana. Hinshaw, Ang Jos., daughter, age 7, born in Missouri; father born in Ohio; mother born in Indiana. Hinshaw, Amos R., head-of-household, age 74, born Sept 1825 in Ohio; parents born in North Carolina; married 46 years; owned farm; occupation: farmer. 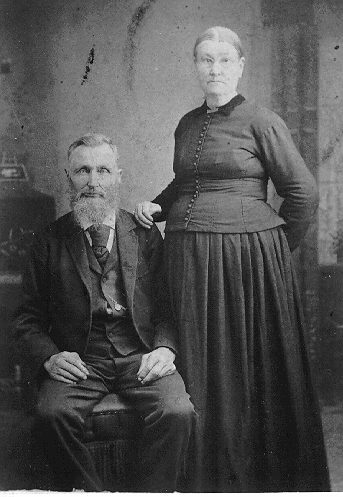 Hinshaw, Elizabeth, wife, age 69, born May 1831 in Indiana; parents born in North Carolina; married 46 years; 10 children, 4 living. Manford, Effie, granddaughter, age 20, born March 1880 in Missouri; parents born in Missouri. 1850 census, Washington Township, Randolph County, Indiana; roll M432-168, pg 41A, line #31, dwelling #6, family #7. Contribution from Jody Logan (). 1860 census, Greensfork Township, Randolph County, Indiana; pg 765, line #7, dwelling #523, family #509. Jody Logan genealogy data: http://www.geocities.com/Heartland/Bluffs/8605/HINSHAW.HTM. 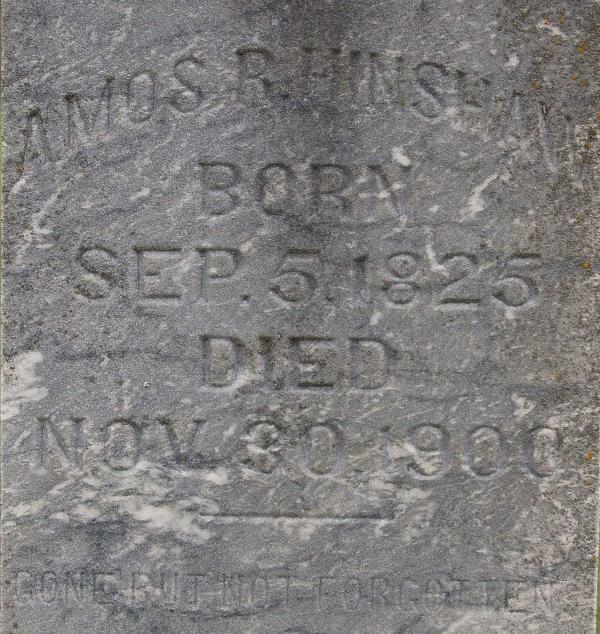 Amos Hinshaw gravestone, Goshen Cemetery, near Wilton, Missouri. 1870 census, Columbia P.O., Cedar Township, Boone County, Missouri; page 32B, line #24, dwelling #580, family #583. 1900 census, Cedar Township, Boone County, Missouri; ED 16, page 49A (sheet 1A), line #1, dwelling #1, family #1. Clinton County, Ohio, Marriage Record Book 4, page 140. Indiana Marriages, 1845-1920; http://www.ancestry.com (county bk page 25). 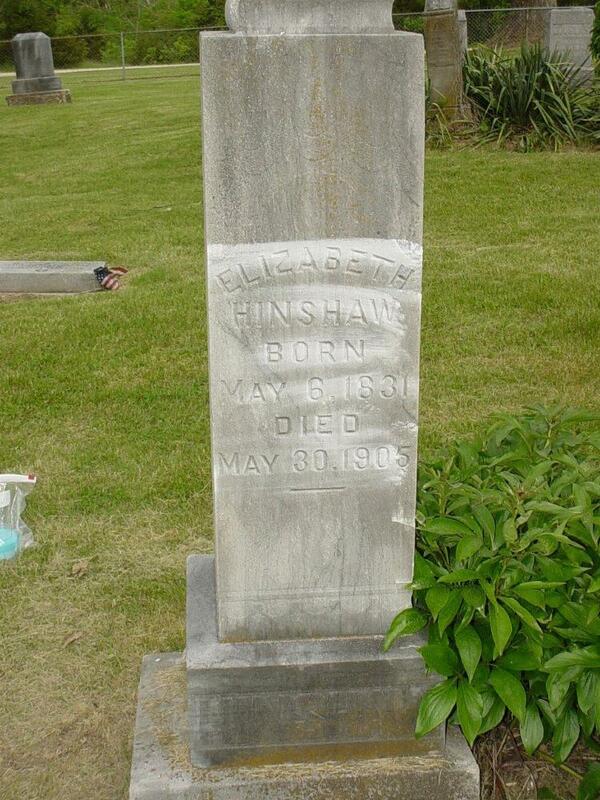 Elizabeth Hinshaw gravestone, Goshen Cemetery, near Wilton, Missouri. Contribution from Jody Logan () citing: LDS IGI. 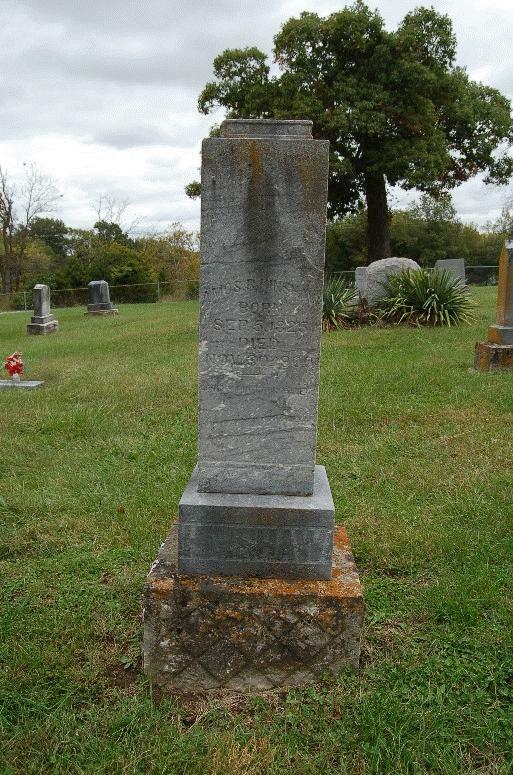 gravestone, Millersburg Cemetery, Callaway County, Missouri. 1890 Veterans Schedule, Cedar Township, Boone County, Missouri; roll 29, ED 16, page 1, line #8, dwelling #162, family #162. 1880 LDS census index, Cedar Township, Boone County, Missouri; roll T9-0676, ED 12, page 63B.